A wonderful dragon is showing his inner self in this great skeleton stamp. Image measures approximately 3-3/4" X 3-3/4". This original design by Fran Seiford is deeply etched and precision cut from premium gray rubber on a 1/8" gray rubber foam backing then mounted on a cling vinyl decal with full sized image for easier storage and use with an acrylic handle sold separately. Made in the USA. "Shake Rattle & Roll" This hilarious skeleton is great for Halloween greetings! Dies cut out the body and limbs, including holes so character can be assembled with brads. Includes a 7 piece clear stamp set, 6 piece die set, one mini action wobble and pack of 10 brads. Two funny skeletons are having a party! Use all their accessories and greetings for your Halloween treat bags, tags, cards, scrapbook pages, invitations and more. Get your "Day of the Dead" on with this lively group. 20 stamps. This Large 4" X 6" set of Perfectly Clear Stamps features premium photopolymer images from exclusive Fran Seiford artwork. Interactive images work together for dozens of fun looks. Use with acrylic handle sold separately. Made in the USA. Halloween themed Hero Arts stamps featuring a bat, a skull, a spider web, and more. Hero Arts clear stamps offer the best quality in the market. They are made in the USA from genuine photopolymer, which is non-toxic, biodegradable, and designed specifically to transfer ink to paper for a true impression every time. Peel off your stamp from its backing and stick to an acrylic block for easy positioning. Mix and match the designs, then clean with water or stamp cleaner. Get picture perfect with these stunning traditional tattoo designs that would make popeye jealous! Containing 24 elements, these designs have been picked as some of the most popular and typical tattoo designs out there that can be combined into huge pieces, or keep to a minimum for style. These designs even featuring the signature dot shading look to them like traditional tattoos for that authentic look. Combine these with the family sentiments to make up stunning designs that are unique and personal. For the Love of Stamps is the new stamping range from premier papercraft manufacturer Hunkydory Crafts! This exciting new collection of fantastic clear, photopolymer stamps have been designed to suit all manner of craft projects and allow you to get extra-creative with that trademark Hunkydory style. Size: A6. Mixed Media Artist Andy Skinner is at it again this Halloween with his macabre Birds and Bones set. A bird skull promises to offer loads of creative fun, while a full, human skeleton will keep your bones dancing. 4 stamps. Skeleton is approximately 2-1/2" X 4-3/4". This quality cling-mount rubber stamp set is made from deeply etched, precision trimmed premium grey rubber. With 1/8 inch thick grey foam for a smooth impression on uneven or textured surfaces, it is backed with a full sized index of the image. The index allows for precise placement of the image when used with a clear acrylic handle. A dapper couple, just slightly dead, are strolling through a cheery graveyard. Image measures approximately 4" X 5-1/4". This original design by Fran Seiford is deeply etched and precision cut from premium gray rubber on a 1/8" gray rubber foam backing then mounted on a cling vinyl decal with full sized image for easier storage and use with an acrylic handle sold separately. 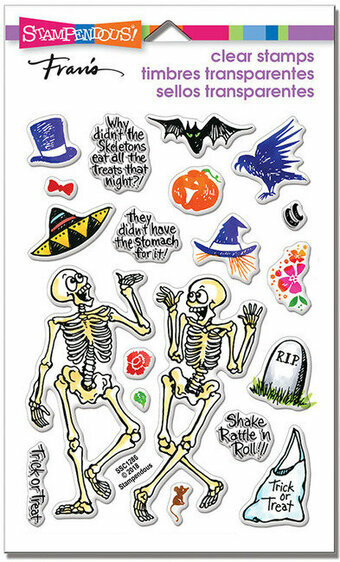 Halloween themed clear stamps and die set from Hampton Art featuring a skull, a raven, and bats.